This webinar featured Sandra Leung, pharmacy lead for antibiotic utilization and stewardship programs (ASPs) in long term care in the Edmonton area for over 20 years, and Mary Carson, former program coordinator for the Do Bugs Need Drugs antimicrobial stewardship program. The speakers shared lessons learned from antimicrobial stewardship pilots at Alberta Health Services and describe the six key features of successful ASPs in long term care settings. Tools and strategies that might be helpful in establishing ASPs and sustaining practice improvements in other jurisdictions were discussed. Sandra Leung has been involved with antimicrobial stewardship programs (ASPs) in continuing care since the late 1990s. She participated in the development of Alberta Toward Optimized Practice Urinary Tract Infection and Nursing Home Acquired Pneumonia clinical practice guidelines and checklists, and has been involved clinically as a frontline pharmacist, promoting and leading development of the strategies in the implementation of ASPs. She is currently the Pharmacy Manager for Continuing Care in Edmonton for Alberta Health Services, and the co-chair of the Edmonton Zone Continuing Care Antimicrobial Stewardship Working Group. Mary Carson was the Program Coordinator for the Do Bugs Need Drugs antimicrobial stewardship program from 1997 until retirement in 2016. Mary worked closely with Toward Optimized Practice of the Alberta Medical Association in the development of clinical practice guidelines and clinical checklists for nursing home acquired pneumonia and urinary tract infections in long term care. With Sandra Leung she co-chaired the Edmonton Zone Continuing Care Antimicrobial Stewardship Working Group and was an active participant in national antimicrobial stewardship working groups since 2005. With over 30 years experience in public health research and education she has a keen interest promoting health-wise behaviours in the community. The Public Health Agency of Canada, with support from the National Collaborating Centre for Infectious Diseases, hosted this webinar on Antimicrobial Stewardship (AMS), and how to advance AMS in the Atlantic. This session built on the previous collaborative efforts to create an Atlantic AMS community that began in June at an inaugural face-to-face meeting in Halifax. The session was open to all interested in AMS in Atlantic Canada (academia, community/tertiary care hospitals, non-profit organizations). Dr. Emily Black of the Dalhousie University, College of Pharmacy, provided an overview of a recent point prevalence study conducted in Nova Scotia (in press). The objective of this study was to determine prevalence and characterize antimicrobial use at acute care hospitals in Nova Scotia. Results and targets for quality improvement will be discussed. Dr. Paul Bonnar of the Nova Scotia Health Authority moderated and lead a brief discussion on next steps for the Atlantic AMS community. An archived version of this webinar is now available for viewing. Please email Margaret Haworth-Brockman, NCCID Senior Program Manager, for access. This webinar was tailored for Public Health Agency of Canada public health officers (Canadian Public Health Service), field epidemiologists (Canadian Field Epidemiology Program), senior epidemiologists in the Field Services Training Unit, Managers and Regional Coordinators. Webinar participants were able to explore interactively some of NCCID’s tools, including the Notifiable Diseases Database (NDDB), the Outbreak Management tool, the Environmental scan on Emerging Diseases Policies and Diseases Debriefs, in addition to learn more about our Alerts, publications and webcasts. 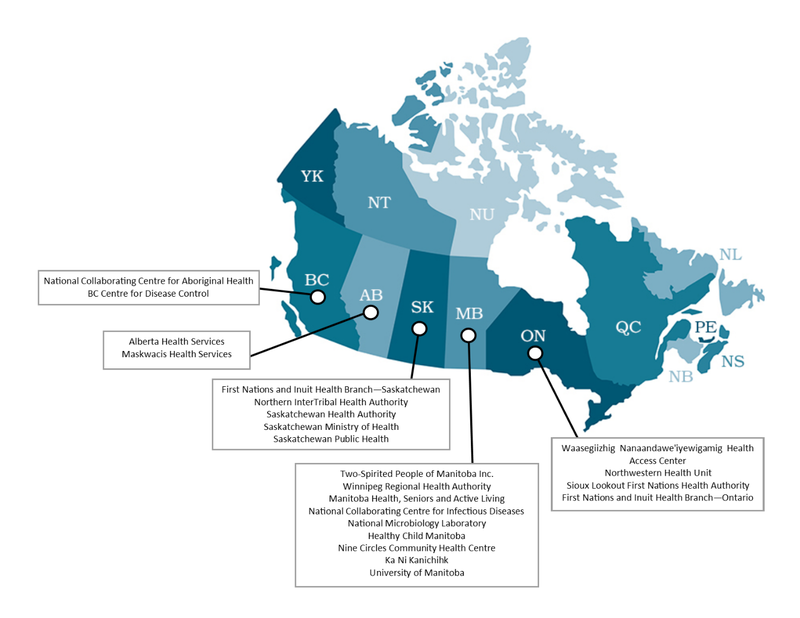 This webinar offered an overview to service providers and policy makers of the current Interim Federal Health Program (IFHP), coverage offered to various refugee streams in Canada. Professor Y.Y. Brandon Chen and Ms. Siffan Rahman discussed in detail the beneficiaries and coverage, the recent changes to the program, registration and reimbursement process for service providers and ongoing challenges and gaps of the IFHP. They also discussed some key findings and recommendations from their respective studies on the current practices of the IFHP. An archived version of this webinar is now available for viewing. Please email S.M. Zeeshan Qadar at sheikh.qadar@umanitoba.ca, for access. Y.Y. Brandon Chen is an Assistant Professor at the University of Ottawa’s Faculty of Law, Common Law Section. He holds Master of Social Work and Juris Doctor degrees from the University of Toronto, and is currently a Doctor of Juridical Science candidate at the same university. His research program focuses on the examination of health inequities facing marginalized populations, particularly noncitizens and racialized minorities. His published work has touched on such topics as health rights litigation, refugee health care, social determinant of health, and medical tourism. Between 2009 and 2011, Y.Y. was publicly appointed to the Ontario Advisory Committee on HIV/AIDS. He served as the Co-Chair of the Committee for Accessible AIDS Treatment from 2014 to 2016. He is currently a Board member of the Canadian Centre on Statelessness. Siffan Rahman is a Program Manager at Somerset West Community Health Centre who oversees the activities of the Ottawa Newcomer Health Centre, which serves and advocates for immigrants and refugees in different capacities. She sits on the Ottawa Local Immigration Partnership’s Health and Wellbeing Sector Table and co-chairs a working group striving to increase access to mental health services for immigrants and refugees. Siffan is a member of the Board of Directors of the Canadian Association of Community Health Centres and co-chairs its Newcomer Health working group. She also sits on the advisory committee of Connecting Ottawa. Siffan has a B.Sc. in Psychology and is currently enrolled in the Masters of Health Administration program at University of Ottawa. Note: Funding for the series was provided by the Public Health Agency of Canada. The opinions expressed are those of the speaker(s) and do not necessarily reflect the official views of the Public Health Agency of Canada or NCCID. The National Collaborating Centre for Infectious Diseases (NCCID) continues its series of public health podcasts and webinars on refugee health. This time our webinar will offer an overview of the Newcomer Health Clinic practice under Nova Scotia Health Authority (NHSA). This will include the model of care, patient readiness and screening procedures devised by the transitional newcomer health clinic. Ms. Ashley Sharpe and Dr. Tim Holland will discuss in detail the transition model developed to move patients from our specialized refugee health clinic to community primary care providers. This will include a discussion regarding current research to validate the model with some preliminary results. For an archived version of this webinar, contact Zeeshan Qadar via Sheikh.Qadar@umanitoba.ca. Ashley is a registered nurse and health services lead in Primary Heath Care, Nova Scotia Health Authority. She supports collaborative family practices, including the Newcomer Health Clinic, which serves refugee populations in Halifax, Nova Scotia and area. From 2012-2015 she worked with displaced populations and others as a nurse with Médecins Sans Frontières/Doctors Without Borders in several different countries. This passion led her first to the nurse position at the Newcomer Health Clinic in 2015 when it opened under the banner of Nova Scotia Health Authority, before moving on to a health services lead position. As Newcomer Health Clinic nurse, her work included clinical care as well as planning for the 2016 Syrian Refugee influx as well as developing and implementing the transition model for the clinic. After completing a degree in philosophy and psychology, Tim Holland began study at Dalhousie medical school in 2007. His interest in Refugee Health began during his Family Medicine Residency in Halifax. Shortly after completing his residency, he began work with the Immigration Services Association of Nova Scotia and the Halifax Refugee Clinic to found a health clinic for refugees in Halifax. The Newcomer Health Clinic opened its doors to Refugees in May of 2014 (previously known as the Transitional Health Clinic for Refugees). Since that time, he has continued to be a physician lead for this clinic, which included overseeing the historic arrival of the Syrian Refugee Influx of 2016. He is also a member of the Steering Committee for Canadian Clinicians for Refugee Care. Aside from his work at the Newcomer Health Clinic, Dr. Holland is also the Chair of Ethics for the Canadian Medical Association, Chair of the Policy and Health Issues Committee for Doctors Nova Scotia and President-Elect of Doctors Nova Scotia. Aside from these “extra-curricular” pursuits, Dr. Holland splits his clinical time between Emergency Medicine and Family Medicine. He currently divides clinical time equally between Emergency Medicine in Truro, Nova Scotia and Family Medicine. Dr. Holland’s family medicine time is equally divided between Refugee Health (at the Newcomer Health Clinic in Halifax) and First Nations health (at the Sipekne’katik Health Center in Indian brook, Nova Scotia). Funding for the series was provided by the Public Health Agency of Canada. The opinions expressed are those of the speaker(s) and do not necessarily reflect the official views of the Public Health Agency of Canada or the host organization, National Collaborating Centre for Infectious Disease (NCCID). June 8, 2017 (Halifax) – The National Collaborating Centre for Infectious Diseases (NCCID) and the Public Health Agency of Canada are pleased to greet representatives from across the Atlantic provinces today to discuss strategies for improving the use of antimicrobials such as antibiotics. Antimicrobial resistance has been in the news more and more and is considered a significant threat to human health by the World Health Organization. It has been estimated that by 2050, annual deaths due to AMR could reach 10 million worldwide, overtaking deaths due to diabetes and cancer combined. And AMR is not just a human health threat; it is a complex issue that has animal, agricultural, environmental and economic implications. Antimicrobial stewardship involves systems-wide organization and approaches to monitoring the most effective use of antimicrobials drugs, and promoting their appropriate use according to national and international guidelines. It is one of four pillars of the Government of Canada’s Federal Framework for Action on AMR, which identifies AMS as conserving the effectiveness of existing treatments through infection prevention and control guidelines, education and awareness, regulations, and oversight. “The groundwork has been laid and there is considerable expertise in this country. Now our task is to reinforce and support AMS programs locally so that patients, practitioners and policy-makers are committed and involved”, said Margaret Haworth-Brockman, Senior Program Manager at the NCCID. For more information on AMR and AMS, and to find additional resources, please contact NCCID at nccid@umanitoba.ca or 1-204-318-2591. WEBINAR / What can Big Data do for Public Health? Highlighting examples of how big data have been applied to foodborne illnesses. In this presentation, Dr. Cheryl Waldner, DVM, PhD (University of Saskatchewan) gave an overview of big data, its opportunities and limitations for public health, and describe examples related to foodborne illnesses. An archived version of this webinar is now available for viewing. Please email NCCID’s Elnaz Shadabi for access. What means are available to public health practitioners for effectively communicating the risk of infectious diseases to the public? When a new outbreak emerges, how can public health convey facts and risks accurately to the public and to policy makers? How are risks interpreted by various audiences? These are examples of some of the questions that public health professionals may grapple with during a new infectious disease outbreak or re-emergence of an existing one. To ensure that both the public and policy makers receive the most accurate information, the means and methods of communication utilized by healthcare providers must be effective. This March 8, 2017 webinar provided different perspectives on communicating risk in an “environment” of change: the intersection of climate change and infectious disease emergence and resurgence. The webinar had two main goals: to present a range of perspectives on good communication about risk for public health stakeholders; and, to allow for discussion on communication for public health, using examples that relate to emerging and resurging infectious diseases in the context of changing climate. Dr. Christine Navarro has been an Associate Medical Officer of Health with Toronto Public Health since August 2014. While training as an epidemiologist, she worked with the Public Health Agency of Canada before getting her medical degree. Christine completed her specialty training in Public Health and Preventive Medicine at the University of Toronto in 2014. Her portfolio at Toronto Public Health focuses on Environmental Health. Dr. Craig Stephen is a veterinary epidemiologist, professor in the Department of Veterinary Microbiology at the University of Saskatchewan, and clinical professor at the School of Population and Public Health at the University of British Columbia. He is the CEO of the Canadian Wildlife Health Cooperative. He has worked in Canada and internationally on ecohealth approaches to emerging infectious diseases. Dr. Anne-Marie Nicol is a knowledge translation scientist at the National Collaborating Centre for Environmental Health. She holds a PhD in Epidemiology from UBC and a Masters of Environmental Studies from York University. Her area of research is risk communication and perception and the roles they play in risk management, particularly in public health. She also teaches health communication, as well as human health risk assessment, at Simon Fraser University as an Associate Professor. Dr. Negar Elmieh is an interdisciplinary researcher who applies both quantitative and qualitative methods to complex health, environment, risk and policy issues. She will share lessons learned from past zoonotic outbreaks on how we can best communicate new threats and balance risk from infection versus potential interventions.